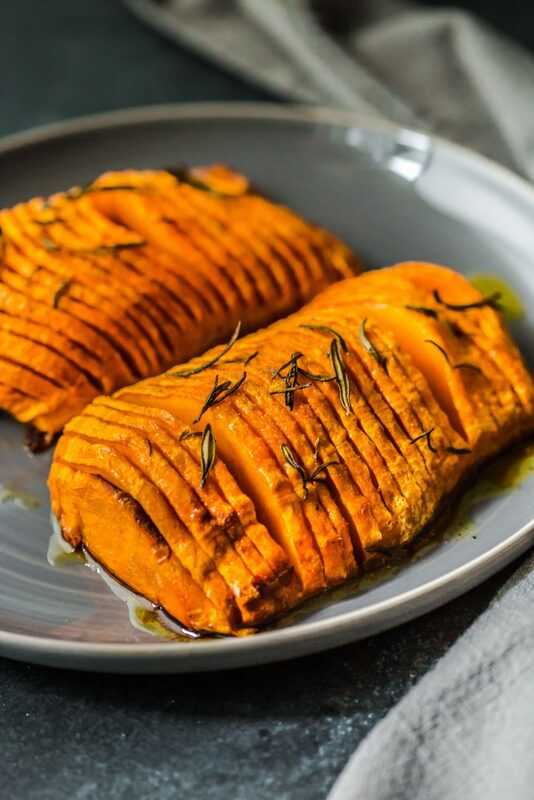 Hasselback Butternut Pumpkin! 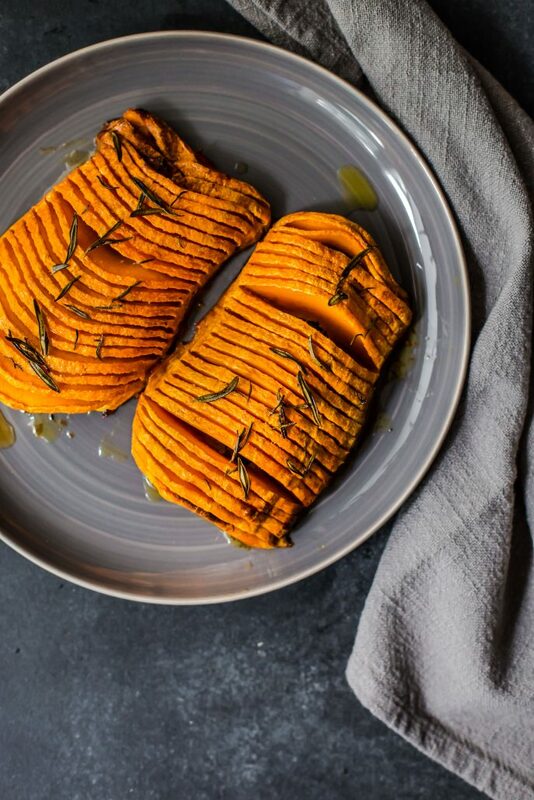 Taking the idea of hasselback potatoes over to pumpkin to create another fabulous side dish! Roasted in a flavoursome glaze of extra virgin olive oil, a touch of maple syrup, garlic, fresh rosemary and more! Are you salivating yet? 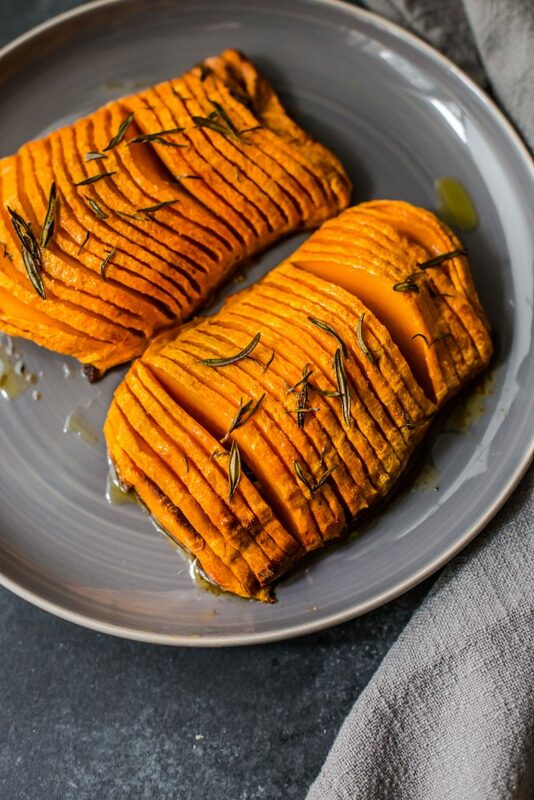 Not only is this hasselback pumpkin so delicious and bursting with flavour, it’s also beautiful to look at wouldn’t you agree? Create your very own showstopper of a side dish that your entire dinner table will enjoy and be raving about the next day! Enjoy! Slice pumpkin in half length ways. Trim off both ends. Using a vegetable peeler, peel off thick skin and the white pith of the pumpkin to reveal the bright orange pumpkin. Scoop out seeds and place each half on a baking tray cut side down. Roast in oven for 20-25 minutes or until soft enough to slice. Whilst the pumpkin is roasting, make glaze. In a small bowl, mix together all glaze ingredients. Set aside. Once pumpkin is soft, remove from oven and carefully cut slits through each pumpkin half widthways, making sure not to cut all the through. Brush oil mixture over each pumpkin half, letting the oil drip through slits. Save some oil mixture for basting later. Roast pumpkin for 30-40 minutes, or until golden and crispy, basting the pumpkin with the oil mixture half way through roasting. oh my goodness!!! Awesome recipe. Fro the frugal version, make a microwave tea 3 Tbsp water and 1 1/2 Tbsp dried rosemary-30 seconds on high. Bottled lemon juice also fine. 2 Tbsp brown sugar also leant color to the glaze as the squash browned . So good!